MARQUETTE — It was announced Thursday that a new pilot program for mental health residents is being introduced in the Upper Peninsula. Michigan State University College of Human Medicine and three other colleges are partnering with the State of Michigan for the Pilot Rural Psychiatry Residency Program. Tovah Aho and Ann Marie Botros have been named as the two first residents in the program, and will start their UP residency in 2021. This program will look to fill the needs of accessing mental health care the UP, where every county except for Marquette is considered to be Health Professional Shortage Area. There have been similar programs for physicians in the area that have been successful, but this would be the first for psychiatry. The program will also provide money to the two residents pay back loans if they practice in the UP for at least 2 years. and Dr. Jed Magen, associate professor and chair of the Department of Psychiatry in East Lansing, presented on the need and opportunity for a rural psychiatry residency track in the UP at the Upper Peninsula Healthcare Solutions meeting last fall. The MIDOCs program is a joint venture between four medical schools in Michigan, including MSU College of Human Medicine, and the State of Michigan. The program provides the funding to expand residency positions where half of the experience will occur in a rural site. Residents involved in this program receive a loan up to $75,000 which may be used to pay off medical school debt. The loan is forgiven if they practice in the Upper Peninsula for two years after they complete their training. The State of Michigan requires the contribution for loan repayment come from local sources. In response to the dire need of psychiatric providers in the UP, the Portage Health Foundation generously agreed to cover the finances for the first two loan forgiveness recipients, committing $18,750 each for four years, totaling $150,000. Data from the Upper Peninsula Community Health Needs Assessment 2018 (UPCHNA 2018), published by the Western Upper Peninsula Health Department, provides insight on the lack of mental health providers in the UP. “Every UP county but Marquette is a federal designated HPSA (Health Professional Shortage Area) for mental health care based on the number of psychiatrist per capita.” (UPCHNA, 2018). Additionally, the data shows a ratio of roughly “one psychiatrist per 39,000 people” across the Upper Peninsula. The capacity of inpatient beds are not being utilized due to the shortage of care providers. Currently there are a total of 39 inpatient beds in two locations, Marquette/32 beds and Kinross/7 beds. Primary care physicians who fill in the void for mental health care in the Upper Peninsula have limited resources. Patients with referrals for mental health conditions, are burdened with lengthy wait times and often have to travel long distances for treatment. The new hospital, UP Health System – Marquette, will see an increase of inpatient beds (50) which will be utilized as new providers move into our region. The rural psychiatry residency pilot program is designed to help increase the number of psychiatric care providers and improve the distribution of psychiatric care in the Upper Peninsula. Resident physicians will train in East Lansing for two years, then come to Marquette July 2021 to complete the last two years of residency education. This isn’t the first time psychiatry residents have been trained in the UP. Over the course of the past 20 years there have been several residents from the Marquette Family Medicine Residency Program who have trained and stayed in the UP to provide care. The commitment and advocacy from UP Health System-Marquette, MSU College of Human Medicine, local faculty psychiatrists and students of the pilot rural psychiatry residency program will help mitigate the shortage by increasing the access to mental health care providers. According to the Michigan Department of Health and Human Services, The Upper Peninsula is the leading region of the state when it comes to depression. The CDC reported a 32.9 percent rise in Michigan’s suicide rate from 1999 to 2016. Primary care physicians across the UP have reported that their patients encounter barriers in accessing mental health resources (UPCHNA, 2018). Local authorities are tasked to provide extra resources as well; in the past year the Marquette Police Department has had 417 mental health related calls. The statistics illustrate the needs in the UP region. The pilot program aims to alleviate the shortage of providers with the goal of having two psychiatry residents each year graduate from this program and stay in the area starting with the graduating class of 2023. The collaborative efforts and goal is to help increase the workforce in our Upper Peninsula rural communities making mental health care accessible to all. The MSU College of Human Medicine Upper Peninsula Region Campus works in conjunction with the UP Health System-Marquette to coordinate the training of family medicine residents and Michigan State University College of Human Medicine medical students. Since its inception in 1974, 286 medical students and 198 resident physicians have graduated from the two programs. 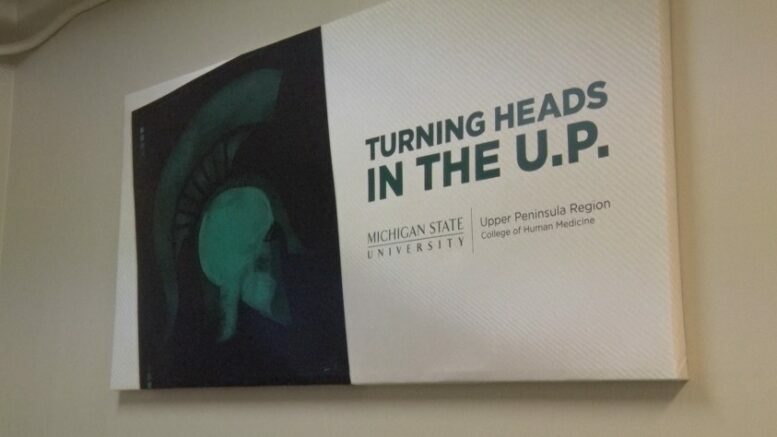 Currently, approximately 30 percent of the MSU College of Human Medicine Upper Peninsula Region Campus physicians are practicing in the U.P. in every primary care and additional specialties of medicine.